Popular culture abhors sophistication and thrives on candor. In this set from the Erzgebirge region (Sachsen), toy figures, turned wood, and bright colors are the sole ingredients of Christmas lore. The Christmas joy of the simple-hearted resonates with the poor in spirit of the Beatitudes. The little angels descending a monumental staircase leading to the modest hut of the Emmanuel, are a playful but poignant reminder that in Christ the divinity has descended into human flesh. 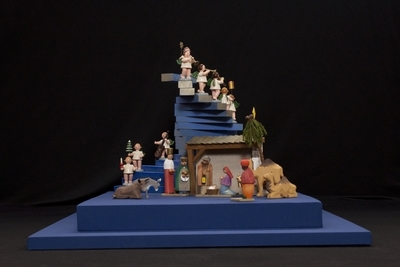 Turned wood figures depicting the nativity of Jesus, created by Günter Reichel in Saxony, Germany in the 1990s. Exhibition label originally written by Fr. Johann G. Roten, S.M. for exhibit entitled "At The Manger" and held at Roesch Library, University of Dayton.